I am definitely curious about Mancos and Hesperus. I dont have any info on the 2 particularly Mancos, I think it is more high desert looking, or am I totally mistaken? I love the high desert with the mountains close by. I was actually thinking a place about 2500 ft up called Bend in Oregon but it is getting so populated and rich I couldnt do it. I just wouldnt fit and wouldnt like it. It is such a beautiful mix though. Here are some pictures around Durango, mostly north of Durango. I think most are up near the Durango Ski Resort and up toward Silverton and the lake is Lake Vallecito near Durango. 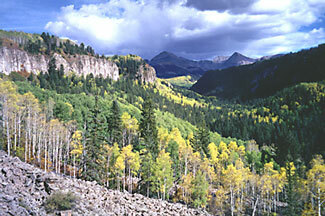 It is very beautiful up there but also as you climb north of Durango, it gets more snow. Was I right about Mancos terrain? Mancos is still in the mountains but right after Mancos as you go toward Cortez, you are right, it is high desert. Cortez is a high desert town. Last edited by I_LUVNM; 12-14-2006 at 03:27 AM.. I live in Farmington, New Mexico and we have a nice airport that isnt small but not large either. It is the Four Corners Regional. Farmington is about 1 hour from Durango. Durango LaPlata is a nice small airport, clean and efficient but would be more limited on flights yet they do have non stop flights into there. Hey, I just checked Travelocity for a round trip from Los Angeles LAX flight to Durango and compared prices to Albuquerque, to Farmington and to Durango and I am surprised! Durango won! Here is what I got: I had for my destination to Farmington, NM so try that and to Albuquerque and to Durango as your destinations to see if the prices change. How small are the planes from towns like Farmington, Durango etc.? And does the airports and rental cars?